Before getting into the experiment I conducted, to see if one can create excellence through teamwork in a consultancy environment, let’s take a look at what cooperational excellence is first. For ages, manufacturing plants have benefited from small highly specialised operations that work in close cooperation to form the product – excellence in operation. Cooperational excellence is nothing more than people working together in small teams in close cooperation, to achieve operational excellence. I believe that a team can perform extremely well, and reach a performance level that exceeds the performance level of each of the individuals that make up the team. Yes, it can – provided the team has a right mix of talented individuals/interdisciplinary experts who agree to help each other out. But is this actually possible in a consultancy environment? Can a bunch of consultancy experts actually increase the quality of their individual assignments by applying the concepts of cooperational excellence? Let’s find out! Last year, I set out to prove that consultants – who, in this case, work individually, or with a project team from the client – could increase the quality of their individual assignments. At that time I worked for a Dutch retail bank, as a part of a Business Process Management department. Including me, there were nine people in the team. Let me introduce you to my team (the names mentioned herein are fictive for privacy reasons): Kim Meyer, Thomas Janssen, Nick van der Berg, Laura de Vries, Max Bakker, Niels Visser, Guus Wouters, Iris Smit, and of course me – all of us aged between 29 and 40, and well qualified for our job. functional project support on implementation project for dashboard tooling. Yes, we had steep targets. Now, what did I intend to achieve with this entire exercise? What were my objectives? and that it would increase the effectiveness and the usefulness of our bi-weekly teamboard standup sessions (teamboard standup sessions are a part of the Toyota Production System, or LEAN, wherein the team gathers around their team board and looks at the performance figures of the previous week; and based on their findings, they plan for the week ahead – while they think of ways to make the week ahead better). Instead of the objectives my manager set, which were: increase engagement, increase team coherence, and introduce common goals; my objectives were: increase the time spent on one’s unique ability (or talent), improve cooperation within the team, and have fun experimenting! Like in each enterprising situation, this entire exercise posed a few complications/obstacles. Earlier attempts of introducing visual management failed in improving employee engagement, mainly because there was no direct influence – as a team – on the targets that were monitored. We were all convinced that teamboard stand-up sessions are useful for our clients in our projects. But some of us, including the team manager, were convinced that the teamboard sessions could be used for our consultancy team as well, to improve both the success of the project and the engagement of the team members. You have to understand that this is hard, because the work is far less repetitive and there is no common goal. But, since it was what we were ‘selling’, she asked us to practice what we preached! What was my solution to the problem? That the consultants help each other, by contributing to each others’ projects. But how will this possibly work? Allow me to explain. In a particular project there may be an activity that the consultant (Consultant A) performs averagely. While the consultant performs this particular activity pretty satisfactorily, he does not excel in it. At the same time another consultant (Consultant B) may excel in the same activity. The idea is that the project I refer to will benefit if the Consultant B helps Consultant A with the activity mentioned above. I’d like to interject here that, as a part of the experiments, when a consultant does not like doing a particular activity, or has to do something he is not good at, he cannot ask for help. He could ask for help, but that is not part of the experiment. Consultant A must ask for help only to let Consultant B use his or her strength. I based the whole thing on a simple idea: every consultant has his own unique ability or abilities or an activity he excels in. Now, the whole team will benefit if each consultant can make more use of his or her unique ability. This will work, because as and when the consultant works on an activity using his unique ability, his efficiency increases and the average time taken to complete the activity also increases. For a few of my colleagues, putting down their unique abilities on paper was difficult. Take Max Bakker’s case. He had problems putting his unique ability on paper. He said, “There’s nothing special that I can do, everybody can do what I do”. I asked him if he thought he was an average consultant. “Yes, sure,” he said. I asked him if there was anything that he did less well than his colleagues. “Yes,” he said again. I then told him that if he was at least average, and worse off in a few areas, then surely there must be a few areas where he was better than the others! Egged on, he found the courage to write down his unique ability. 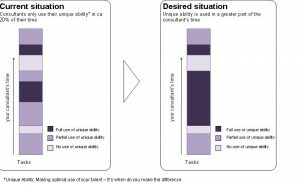 What could be a unique ability or talent? It could be anything that consultant excels in: structuring large amounts of data, or delivering a message (in a presentation, for example), or creativity in approach and solutions, or analysis of stakeholders and stakeholder management, or analysis of data problems, or creating a storyline. The whole exercise not only boosted the confidence of all involved, but it also increased teamwork (even though each person had a different project) and made consultants feel like they were a part of the team, more than ever before. This is what Thomas Janssen had to say: “I was truly inspired by the idea that we could allow each other to use his/her unique ability. The idea that everybody has his/her unique ability really appeals to me”. Laura de Vries was enthused too, and said to me, “I’ve never felt more like I was part of the team than I did at that time”. In the diagram below, you will see that initially a consultant uses his unique ability only 20% of the time. During the course of this test, he will have used his unique ability much, much more, thus making optimal use of his unique ability or talent. So, I asked everyone to write down what according to them is his/her unique ability, at the kick-off session. I stated that that point that the duration of this pilot test would be three months. Three months of sharing abilities and learning. Once in every two weeks, each consultant identifies activities that a colleague can help out with – enabling the colleague to use his/her unique ability to the fullest. We also decided to hold bi-weekly meetings to evaluate and discuss time constraints due to all the reshuffling of work. I know you have been waiting to know what happened finally. Here you go. All of us met after three months and this is what we learnt: in five instances, help was asked and in turn offered. And in each case, it increased the quality of the project according to the involved consultants. I’d like to share three examples with you. In the first case Thomas Janssen asked Max Bakker (yes, he got to use his unique ability!) for help on: analysis of risk of data errors within a Lean Six Sigma project (a part of the Measure phase – refer my paragraph on DMAIC). In the second case, Nick Van der Berg asked for Laura de Vries’ help on: designing the project approach in the Define phase of a Lean Six Sigma project. And in the third case Guus Wouters asked Niels Visser for help on: creating the storyline at the end of the Analyse phase of a Lean Six Sigma project. In all the cases, the consultants who helped out with their unique ability enjoyed it very much, while being positive the entire time, even though it was quite hard finding the time to help out their colleagues. And each of the consultants who asked for help felt that his/her project definitely benefited from the contribution made by his/her colleague. I must mention here that a few of the consultants found it hard to find a suitable activity/activities in their project, especially on a regular basis. Was my experiment a success, then? I answer with a resounding “Yes!” – the pilot showed that this concept works – only in those instances, though, where it was possible to find a match between an activity and a unique ability. On hindsight I think that it was the difficulty in finding enough matches that hindered the pilot. Also, the fact that not everybody participated in the pilot hindered the results. But in spite of all that, the pilot definitely showed potential! The whole exercise according to me needed more time, and more management attention, and positive thinking.